Thursday afternoon everything is in place, the tables set up the chairs in place the coffee urns ready to fill as the end of the construction phase of this project is reached and the first big event takes place in this new facility. 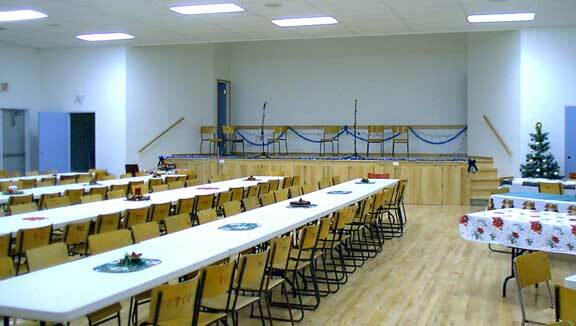 The afternoon will have some entertainment then the potluck supper followed by a dance. Over two-hundred tickets have already been sold as the seniors of Tisdale and the surrounding area come out to celebrate the completion of their very own recreational centre. The picture below is a QuickTime virtual reality image so if you do not have QuickTime downloaded into your computer you will not be able to see this scene which shows the whole scene where you can just move your mouse arond to see left and right up and down. Microsoft's media player can not display this image so simply download it and it will install itself into your computer adding considerably to its capability.